It was nine in the morning. I already woke up, but the girls were still asleep. Maybe they were exhausted after too much walking at the day before. 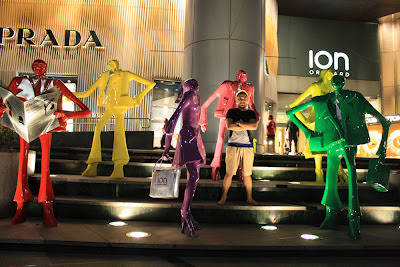 As our deal that we made the night before, we should have left the hotel at ten, and then go to Suria KLCC Shopping Centre. Actually we didn't have much time to spend in KL at that day because in the afternoon we should catch a bus to Singapore. We already booked a bus that left at 15.30, and we should check out from our hotel at 14.00. It means we only have time about four hours. Don't want to waste any more time, I urge myself to took a shower and then I woke up the girls and tell them to prepare. Suddenly I felt a bit hungry. Normally I don't eat breakfast regularly, but since I realized that on this trip I should take a walk quite a lot, I might need to have more energy. So I left the girls and went to the dining area at the lobby for breakfast. I was really excited to try Subway's sandwich, because my friends told me that the sandwich is really tasty. 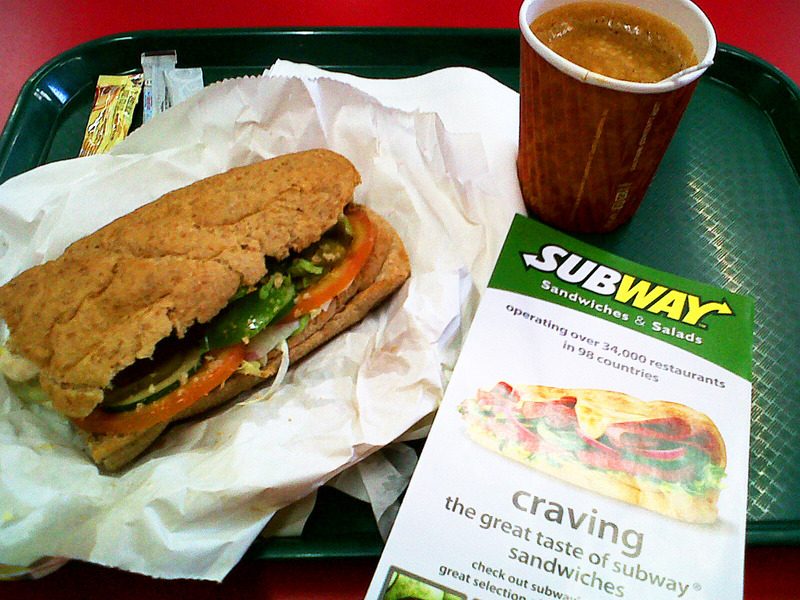 For breakfast, Subway offers a set menu of a sandwich and a cup of coffee. But the choice of the sandwich was very limited, and they didn't seem appealing to me. So I ordered another sandwich that was not included to the set menu. My eyes started scanning the menu, and I made my choice: Oven Roasted Chicken. Hmmm... Sounds yummm! Then the staff asked me about the choice of bread. 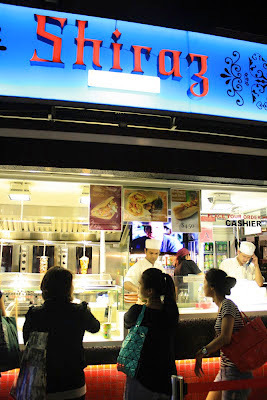 They had several type of bread: Honey Oat, Roasted Garlic, Italian Herbs & Cheese, Parmesan Oregano, Wheat Bread, etc. I chose the last one, I thought it's better to keep the bread simple, and It's healthier, I guess... :D. Then the staff asked me, "Foot-long?". Didn't know what to answer, my eyes were looking at the signboard, seeking an explanations about what she meant. Ah, I see... Foot-long means the 6 inches or the whole bun. Yes, you can order for the whole or only half of it. My god, 6 inches bread for breakfast? Didn't it seem too much? Hahaha.. "Half, please...", I answered. Then the staff asked me once more, this time was about what veggies I want. Errr, this choosing game were really confusing, then I said, "all of them". "Sauce? ", she replied... Oh my, I didn't expect that she had another question for me. Can I do, "phone a friend, or ask the audience?" the question was getting harder like I was in Who wants to be a millionaire quiz. Finished shopping, then we went back to the hotel by hiring a cab. It was 1 PM already when we arrived at the hotel. We had one hour to pack our baggage and put the shopping bags in. The check out time at Tune Hotel is actually at 12.00, but we bought the late check out add ons so it extended our check out to 14.00. 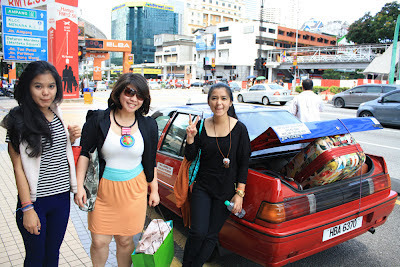 After check out, then we hired a cab to deliver us to Corus Hotel, the departing point of our KL-Singapore bus. 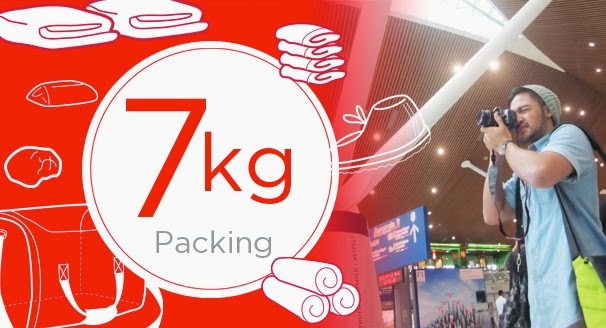 It was so funny that Chika's large baggage didn't fit into the taxi's baggage space, so the taxi driver just lowered the trunk lid and hooked a rubber band to kept the baggage standstill. 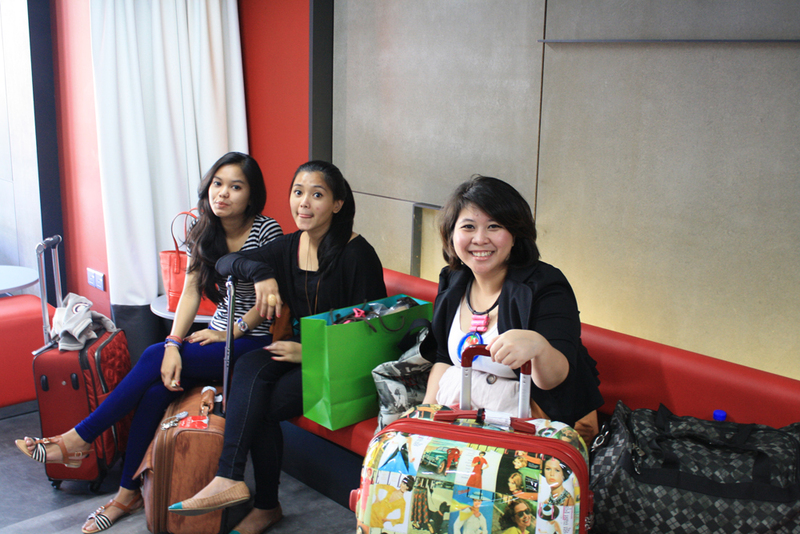 Inside the lobby of Corus Hotel, then we found the check in counter of the bus serivce. 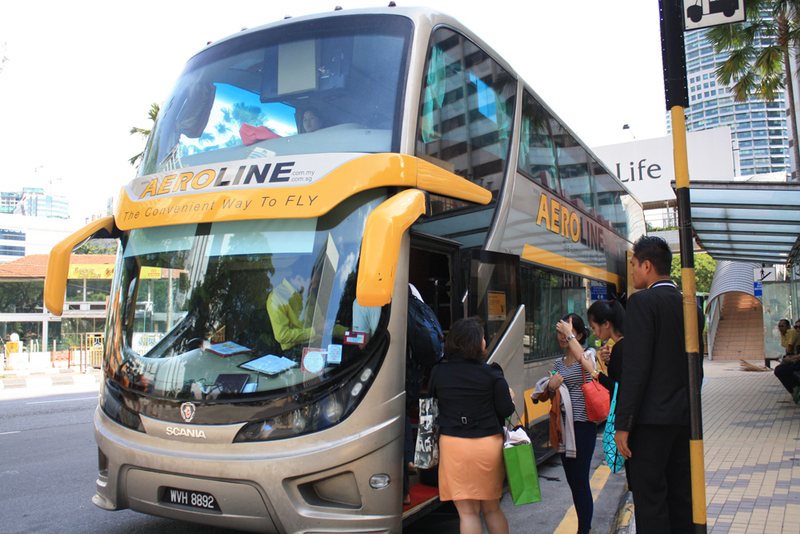 We used Aeroline bus, which I found via internet and I've made my booking before the trip. 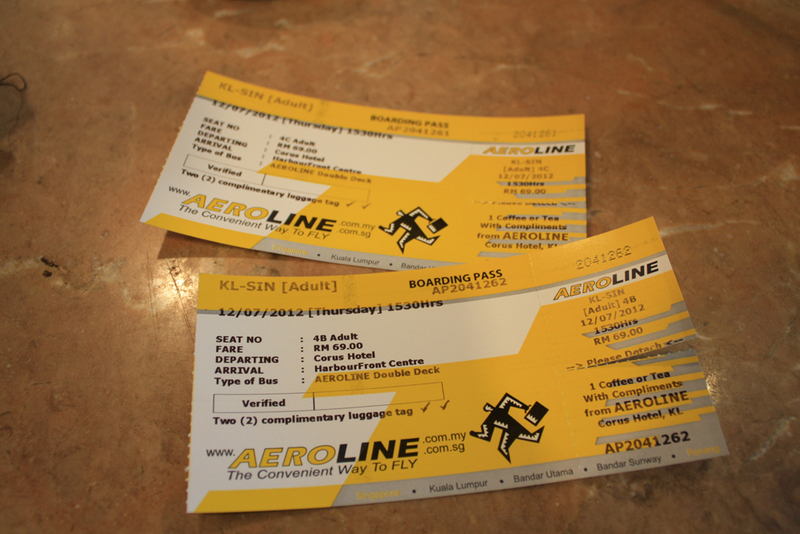 The normal fare is 95 Ringgit, but luckily they had their before Ramadhan promo so it was only 65 Ringgit per person. After checked in, we got the boarding pass and then we waited at the waiting area. In this waiting area we got a complimentary tea or coffe, but we need something more than that because we hadn't our lunch yet. But since we need to supervised our baggage, so we went for lunch by turns. My girlfriend and I went first. 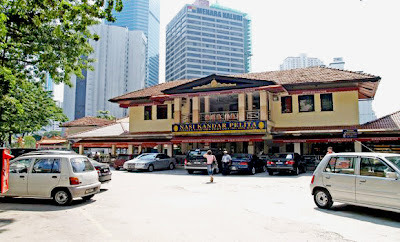 Luckily, just across the hotel there was a restaurant named "Nasi Kandar Pelita". At first, I thought that this was something like nasi lemak, but it's different. 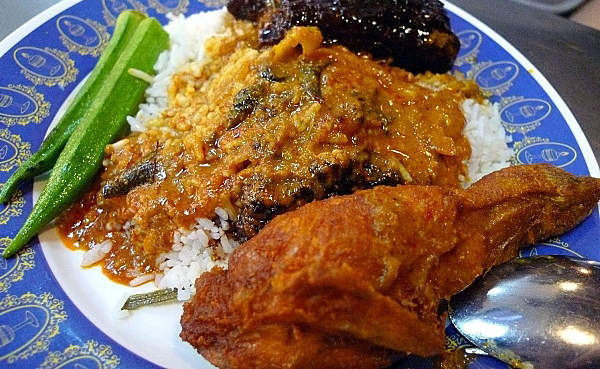 Nasi Kandar is a popular dish originated from north Malaysia, especially Penang. It is a meal of steamed rice served with a variety of curry and side dishes. This dish was taste much more like Indian food. It was Rani and Nene's turn to had their lunch, but they had better to be hurry because it was getting closer to the departure time. 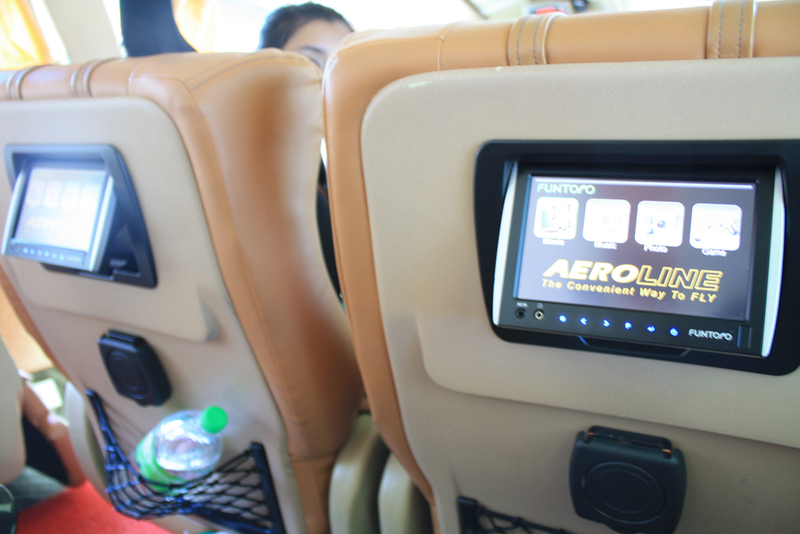 And yes, the Aeroline bus was very on time. The bus has two floor, the first floor was where the driver at, toilet, and a lounge that the passenger could use whenever they're bored. The second floor was where we sit, and the seating arrangement is 2-1. 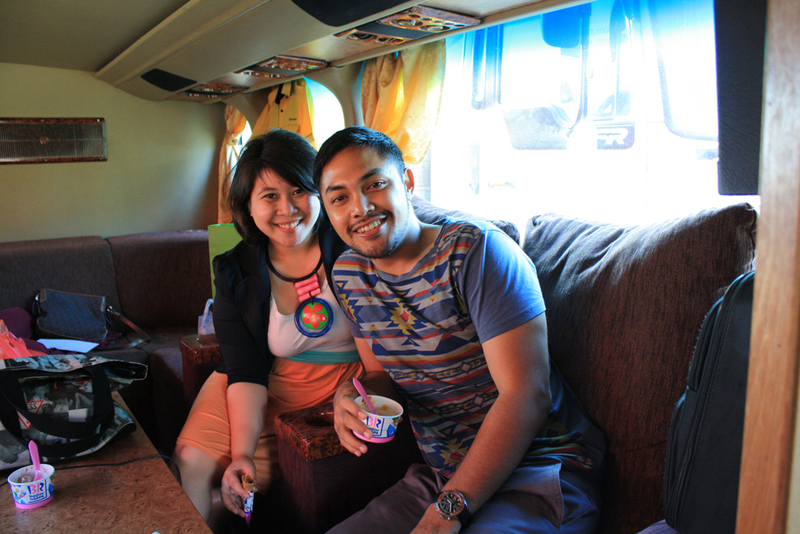 Not so long after we departed, the cabin crew distributed a bottle of mineral water. 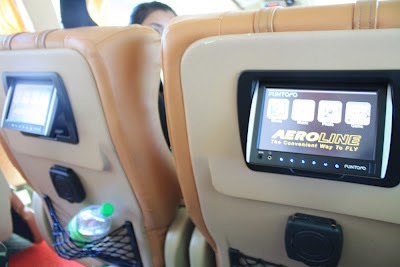 This trip took about 5 hours to reach Singapore, but with the comfort of the reclining chair, and with in-flight entertainment in front of us, it would be a pleasant journey. After 30 minutes, the cabin crew made an announcement that he would distribute the meal. I didn't think that the meal would be distribute that soon. If I knew, we shouldn't have to had our lunch in a hurry. But it's okay, at least I've enriched my culinary knowledge by trying Nasi Kandar. 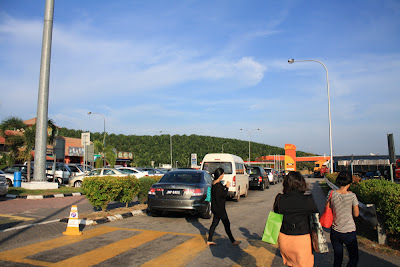 The bus ran very fast along the Malaysia's "Lebuhraya Utara-Selatan" or the North-South Highway, and we were all asleep until the cabin crew woke us up with his announcement that the bus would stop at the resting area. 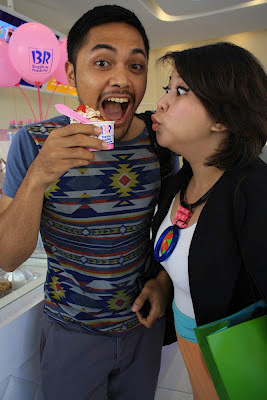 It was a very hot and humid afternoon, luckily there was Baskin and Robbins stall at the rest area. A three scoop sundae with caramel syrup was something to beat the sun heat. After 15 minutes stopped at the resting area, then the bus continued it's trip. Along the way, the scenery at the side of the highway was just oil palm tree and I was surprised knowing that it was six thirty in the evening already but the sun still shone very bright. 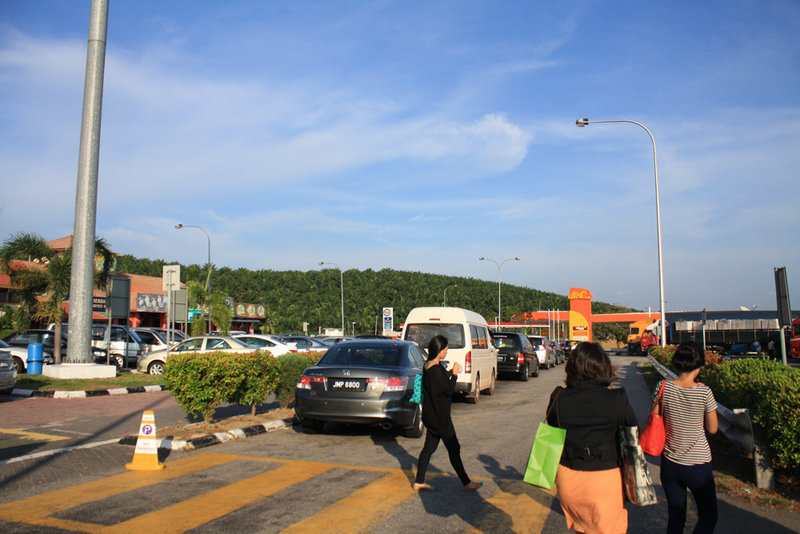 At about eight in the evening, we arrived at the immigration check of Malaysia in Johor Bahru. 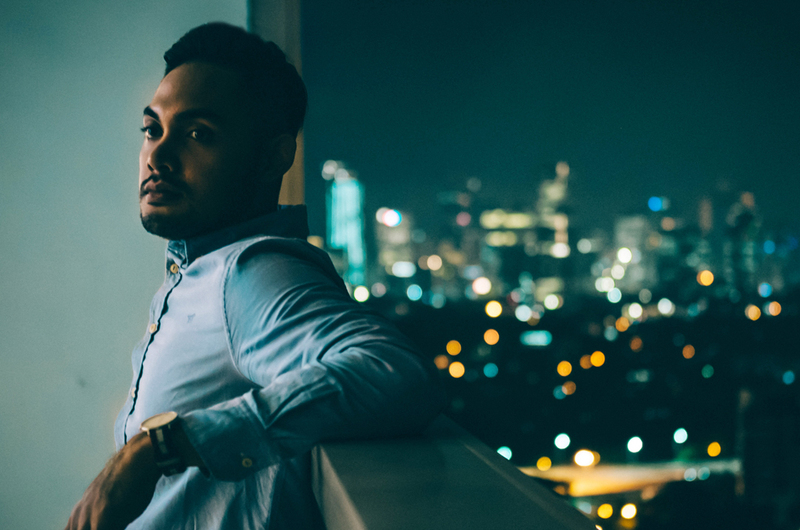 Johor Bahru is the closest part of Malaysia to Singapore. All of the passenger should get off the bus and go to the immigration desk. The process was very fast. After I finish the immigration check, the bus was still waiting for all the passenger to get in. So I lighted my cigarette up and started smoking, but then the cabin crew approached. He asked me whether I had a pack of cigarette that I haven't opened yet, and I said yes I have one. Then he recommended to open it and took it's sealing. He said that I should did that to prevent I got taxed for the cigarette in Singapore's custom. Because it would cost like S$7 (Rp 52,000) per pack. Hey, it's even more expensive than the price of the cigarette itself which was only Rp 15,000 when I bought in Jakarta. So then I opened the seal. 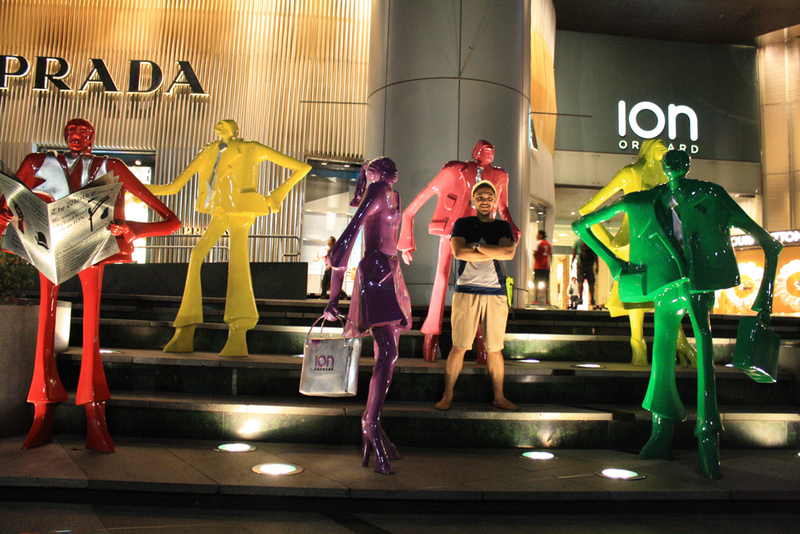 It was ten in the evening, and the orchard road was still crowded. 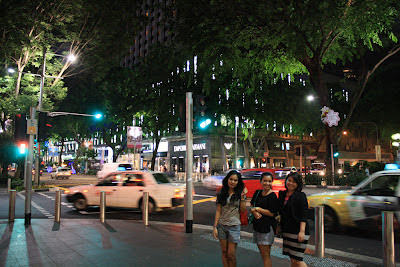 The taxi stopped right in front of Lucky Plaza, the place where we would spend the nights in Singapore. Lucky Plaza is a shopping centre, but on the top of it there is an apartment building. Some of the apartment units is owned by Indonesian, and they rent the rooms for public. At Rani's previous visit to Singapore, she also stayed at Lucky Plaza. So this time, she was the one who managed our accommodation. The room that we rent was quite small for four of us. 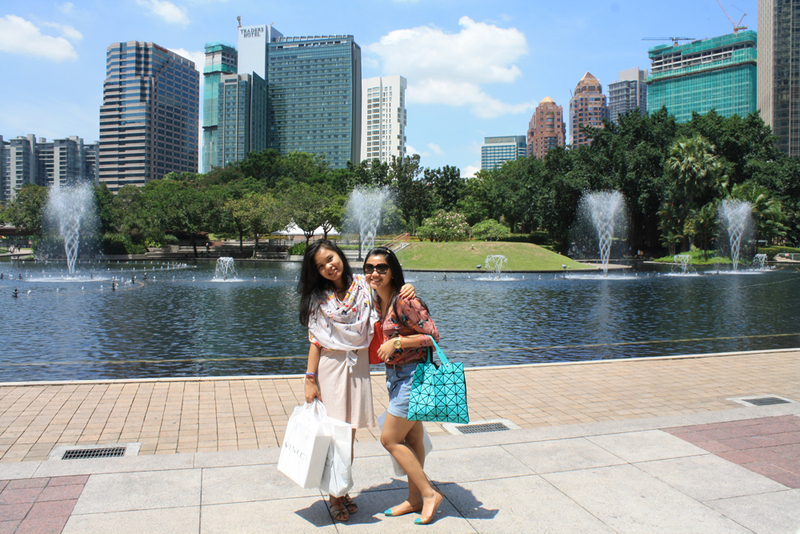 But since we visited Singapore in high season, it was the cheapest room available. Well, for me, as long as the air conditioner is working, everything is fine. 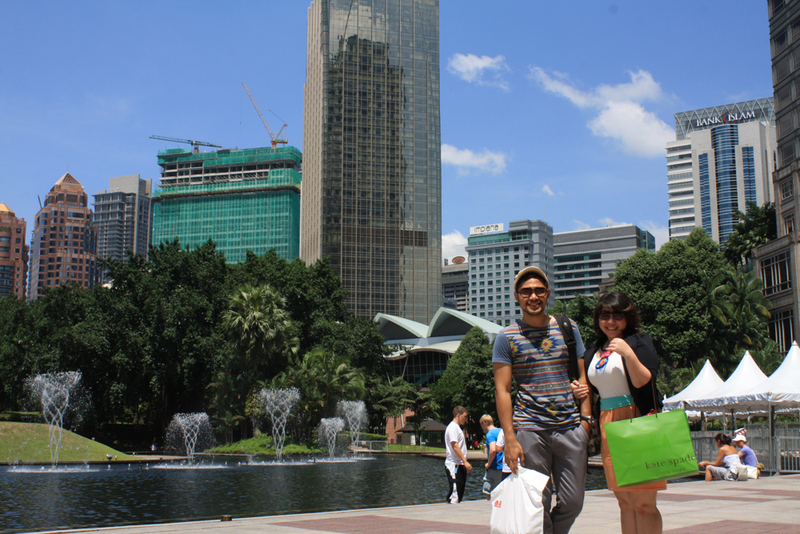 It was too late already for us to explore Orchard, but we won't miss the rest of the day. 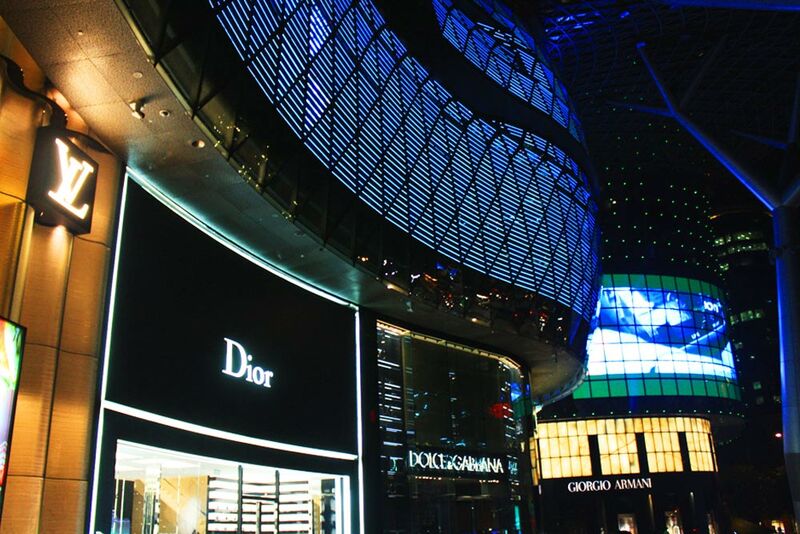 We used this time to take a picture of Orchard at night, and also late-night snacking. I bought a small sized hot dog that costs S$7 (Rp 52,500)... Hmmm... I have to get used to with the price in Singapore, because everything there was much more expensive than in KL. After that, then we went back to Lucky Plaza because we had to recharge our energy, as we would spend the whole day in Universal Studio Singapore at the day after . So, this is the end of the 2nd part. 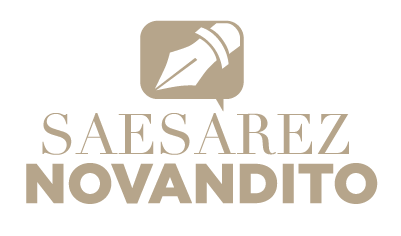 Stay tune for more exciting stories in the upcoming posts... See ya!